Our Advanced Trauma Life Support pin is in the shape of a shield approx. 3/4" high . It has a white background with a redout line. It uses a red heart with a PQRST wave pulsing through the pin. 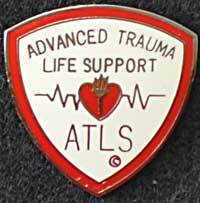 This medical lapel pin features the letters"ATLS" to recognize your achievement. Uses butterfly backing clasp to hold pin.